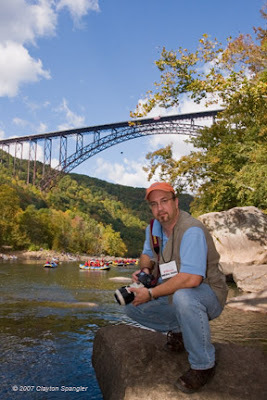 From top to bottom: Bridge Day at the New River Gorge! 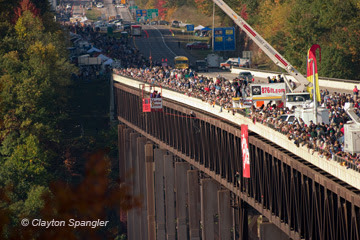 Every year, we have a base jumping extravaganza second to none- Bridge Day! 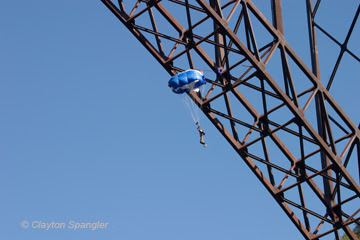 876 feet above the New River Gorge parachuting BASE jumpers jump off a perfectly good bridge and have 8 seconds to open their chutes and survive. I've only covered this once when someone didn't make it- but there are rocks on the shore, so even if you make it that far and miss the landing area- you can still end up in a world of hurt! 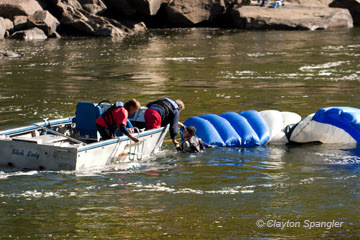 Jet boats cover the water landings and emergency crews are everywhere- so if you do get hurt; help is right there waiting on you- personally, I'm content to already be at the bottom of the gorge- even if it takes me a little longer to get here! This was more amazing than the photo can convey. Of course; not one to take the standard view- I turned my camera to the side and caught the sidelight of the sunset! 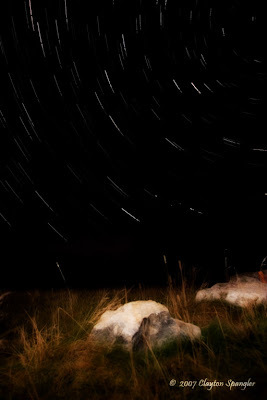 Here is my first attempt at "Star Trails" using a digital camera- Room for improvement of course; but a lot of fun to try! 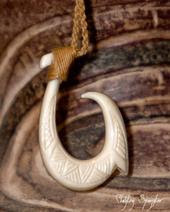 So....if anybody has any connections to or IN Hawaii; check and see who the new group or artist is that carries on his tradition. No slack key guitar music please! I'm much more interested in basic traditional authentic hawaiian songs, chants, and the like. I had someone from Maui contact me personally with this list of artists to check out! Mahalo goes out to Fred! Thanks to everyone who took the time to contact me at my personal email! 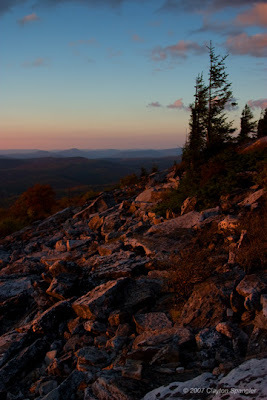 Things are progressing right along at image central- here's a shot of pine trees on Dolly Sods at "Bare Rocks". Notice that the trees are only growing limbs one way? That's because the weather is so severe and the winds so strong there that the limbs are all going in one direction! The elevation is a litle over 4000 feet and the vegitation is similar to what you would find in Canada. A very unique place to visit! That's all for now; have a great day! 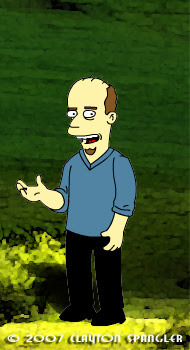 Well gang, It's that time of year again! Fall is here; Time to find that perfect light and match it up to some Awsome locations. I'll be traveling to west Virginia's Potomac Highlands for a few days- Some of the states most photogenic landscapes! I'm not going to be able to "post from the road" in realtime; But I'll try to keep a few notes and images from the days to go with them for a "Post" post. Green is... well, Green- and good for everybody! But as photographers we sometimes don't think we have much impact on the environment by what we choose to shoot, or how we have to photograph. But we do! We can make a HUGE difference by shooting closer to home, photographing places and things we care about, taking better care of our equipment. 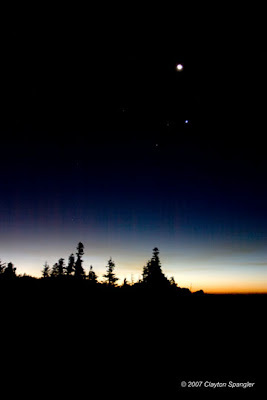 Jason Moore at Jason Moore Photography's Blog turned me onto the Nikon supported "Assignment Earth" and has tips on ways we can come together as photographers and make a difference. and make a difference with your photography! Thanks to the Charleston Camera Club for having me speak at thier meeting Monday night!